I promised myself (and a friend) that I’ll continue writing in this blog. In fact, regardless of the dramatic shifts that my life has been forced to succumb to, this blog is the one thing that I wish to keep and continue for a really long time. Because apart from all that’s happened to this point in my life, it feels good to have something constant throughout. Something to reach out to when in need of some comfort. Something I can rely on no matter what. 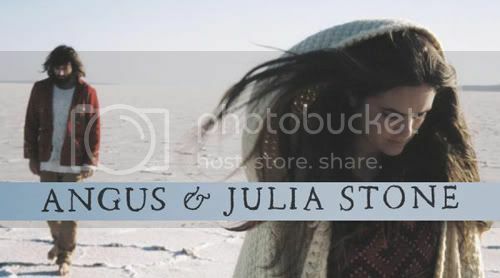 I’ve found that given the right moment, the right place, and the right atmosphere, Down the Way, - the latest album by the Sydney-based Folk duo, Angus and Julia Stone - could either be the best album you’ve ever heard this year, or a complete snooze-fest from start to finish. I’m still decidedly, pretty undecided about that part. But one thing’s for sure, ‘Big Jet Plane’ is one tune that I’ll be keeping close to me for weeks, months, even years to come. Its soothing nature formed by the simple, breezy melodies instantly sways you to nestle against its warm, cozy harmonies. Just perfect.